A Yagi antenna is used for distance communications, typically 4 to 8 Km point to point. A-Y3-6 UHF 400-520MHz 6 Element Yagi Antenna. A-Y470-625-12DBI Yagi wideband antenna, 12dBi gain, 470-625 MHz. SY303 Yagi directional antenna, 6.5 dBd gain, 380-475 MHz. SY307 Yagi directional antenna, 10 dBd gain, black anodized, 340-512 MHz. SY3072 Yagi directional antenna, 12.5 dBd gain, dual, black anodized, 340-512 MHz. SY3074 Yagi directional antenna, 15 dBd gain, black anodized, quad, 340-512 MHz. SY307R Yagi directional antenna, 10 dBd gain, radome enclosed, HD, 406-470 MHz. SY350 Yagi directional antenna, 7 dBd gain, broad band, 406-512 MHz. The Yagi antenna range is robustly constructed to be high performance for critical and remote installations. They are manufactured either from 6060TS grade aluminums alloy and powder coated, or from 316 grade stainless steel, with all antenna’s being TIG & MIG welded. Rojone has been designing and manufacturing antennas since 1985. The majority of our antennas were designed for specific applications or to meet Customer requirements. 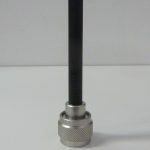 ¼ Wave, Hand Held Portable Antennas, BNC or TNC ConnectorizedUHF 400-520MHz. Rojone offers a high performance omnidirectional antennas designed for the 800 MHz / 900 MHz ISM band. This range is ideally suited for mulltipoint, Non Line of Sight (NLOS) and mobile applications. Radio Frequency Identification (RFID) is technology that uses radio waves to transfer data from an electronic tag (RFID Tag), swipe card or label to track vehicles, equipment, packages or people through to a reader. It is effectively an electronic bar code. Passive RFID tags (those without a battery) can be read if passed within close enough proximity to an RFID reader’s antenna. It is not necessary to “show” the tag (unlike barcodes) therefore they can be read even if enclosed in a box, carton or container. RFID tags can be read hundreds at a time, making it very efficient & cost effective. RFID can be used in many applications such as tracking and managing inventory, assets or people. Tags can be affixed to just about anything – cars, computer equipment, books, mobile phones, etc. RFID is a superior and more efficient way of identifying objects than manual systems. 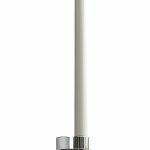 The AE-JD-0820 Jammer Discone Antenna is a rugged all weather model, enclosed in an ABS radome, uses all ultra-corrosion resistant aluminium alloy does not require any field tuning or adjustments. The compact size of the omni-directional antenna allows easy handling, shipping and is highly suitable for transmitting & receiving without having the requirement of multiple antennas. 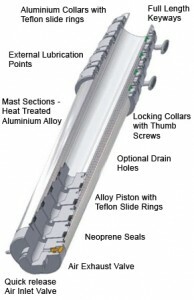 The cylindrical enclosure is used for low wind loading and for minimal effect of ice formation on the antenna operation as well as providing an aesthetically pleasing appearance. 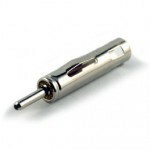 The jammer discone antenna is supplied complete in assembled condition. This discone antenna has smooth VSWR and constant gain over the 800-2000 MHz frequency band. The AE-JD-0820 jammer discone antenna consists of ultra-corrosion resistant radiating elements and is enclosed in ABS housing. The ABS has excellent transparency for radio signals and is mechanically robust to support extra mechanical strength to the discone antenna. The AE-LPH-800-200-400W log periodic dipole antenna is designed to provide wideband directional transmission/ reception of radio signals from 800 to 2000 MHz bands. 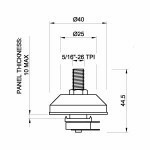 The compact size of the log periodic antenna allows easy handling and specially designed mounting arrangement results in fast installation. This high gain LPA provides strong performance over the entire frequency of 800-2000 MHz as the LPDA does not use loading technique to reduce the overall size of array. This log periodic antenna operates at D.C. ground with low resistance discharge path for protection against lightning and for immunity to noise. Output of log periodic antenna is provided via low loss coaxial cable at the back end of the antenna boom. The HyperGain model A-PDA5158-28 is a high performance broadband solid dish antenna designed to operate from 5.1GHz to 5.8GHz (5125-5850 MHz). The wide band design of this antenna eliminates the need to purchase different antennas for each frequency. This simplifies installation since the same antenna can be used for a wide array of wireless applications. This antenna features 287 dBi of gain with a 6° beam-width. It can be oriented for either vertical or horizontal polarisation. This product is a suitable alternative to Andrews PX2F-52-NXA (Andrews is a registered trademark of CommScope). A Multi-input Multi-output (MIMO) antenna is one that has two or more antennas in a single physical package. The advantages of a MIMO Antenna is that they offer significant range and throughput compared to traditional Wi-Fi antennas while using the same transmit power. The IEEE 802.11n standard uses MIMO technology to increase performance, range, and reliability. MIMO antennas are ideal for use with wireless Access Points/CPE with MIMO capabilities. These antennas are available for 802.11a/b/g/n as well as 802.11ac applications. MIMO Antenna types include Ceiling , Mini Patch, Panel, Dish and Yagi antennas. Custom MIMO antennas are available.